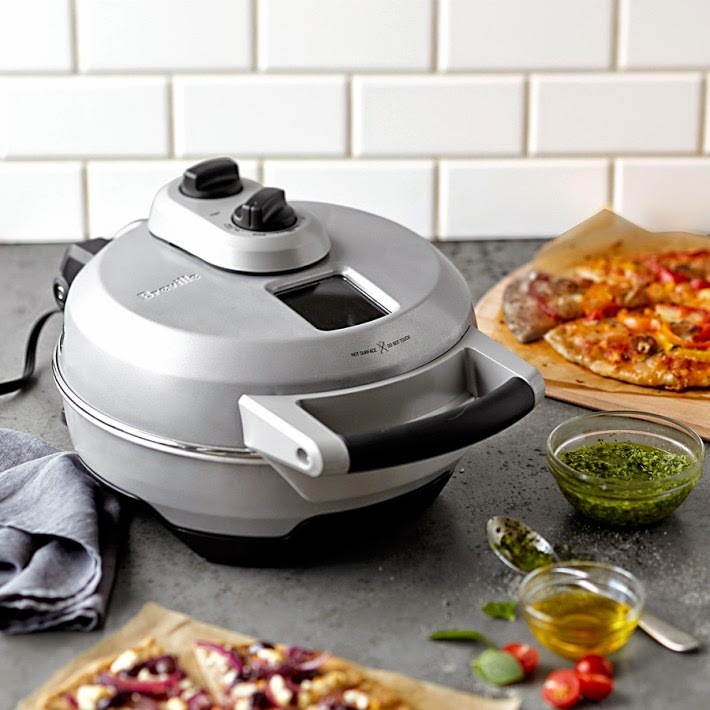 My gadget-happy husband saw the Breville Pizza oven in a Williams-Sonoma catalog (photo) and decided it was just what we needed. I have tried all kinds of pizza stones, bricks, cast iron etc. in the oven and on the grill, but was never totally happy with the results. I wasn't so sure this would work either. Was I wrong! This oven has enabled me to make delicious, crisp-crusted pizza every time. At $149 from Williams-Sonoma I think it paid for itself in less than 3 months! Not only is it very inexpensive to make pizza at home, it's much healthier since you control the fat content of what goes into it. You can also put anything you like on top - just make sure you don't overdo the toppings! The idea of rolling the dough out on parchment and then sliding it onto the stone is nothing short of brilliant - it saves so much mess. Breville has their own video for using the oven. I have found that it is not necessary to prick the edges of the dough as long as I roll it out quite thinly. Also, there is a "viewing" window on top of the oven. After a few uses you can't see through it but, by the time that happens, you will have the timing down just right so that it's not really necessary! Combine dry ingredients in a large bowl, add water and stir until dough forms. Turn dough out onto the counter and knead until smooth and elastic - you may need a little extra flour to dust the dough and your hands if the dough is sticky. This takes about 10 minutes. If you prefer, you can do this in a mixer using the dough hook. Place in a lightly oiled clean bowl, cover with plastic wrap and allow to rise until doubled in size. Punch dough down lightly and divide evenly into four pieces. Place each piece on a lightly floured square of parchment paper, cover with a clean kitchen towel and allow to rise again. Roll the dough out on a large square of parchment paper, add the toppings of your choice and place in the preheated oven for 2 minutes. Remove the parchment and continue cooking for 5 or 6 minutes or until pizza is cooked and lightly browned on top. I used traditional tomato sauce, mozzarella and Parmegiano cheese. For a white pizza, I spread the dough with a paste of roasted garlic*, topped that with mozzarella, Parmegiano and ricotta cheeses. A family favorite is pizza spread with fig jam and topped with sliced pear and gorgonzola cheese (photo right). I am sure you can come up with some great variations on these. *To roast garlic, cut off the top of a whole head of garlic, place on a square of foil large enough to enclose it entirely and drizzle with olive oil. Place in a 350º oven and cook for about an hour. Allow to cool and just squeeze out the garlic. I mash it thoroughly with a little olive oil. It keeps for a week or so in the refrigerator and can be frozen.